In the end of the 12 hours of flight from Singapore to Munich, I found that Mr. Tung is really good in playing Sudoku. He found most, if not all, of the difficult numbers before me (assuming I probably could find it) :|. Although in the end we found that we made some mistakes, but that was pretty cool. Something also worth to mention, I finished watching Sherlock Holmes “A Game of Shadows” (finally) and Happy Feet 2. 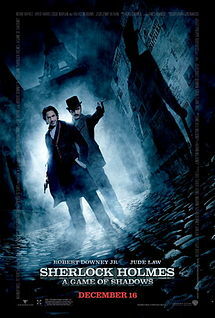 As expected, Sherlock Holmes is an awesome movie *Holmes’ fans* :D.
We transited at Munich, Germany. At first, I thought we had time to rest. However, soon we realized that our next flight was only 30 minutes after our previous flight. It was not because of delay, but it was purposely bought that way :|. We finished some administration matters and run in panic to the boarding gate :shock:. Our names started to be called using microphone because the boarding time was almost over. To my surprise, besides our names, there was one other person who was called. I was surprised that he was Mr. Fredy Purnomo, head of School of Computer Science, Binus University. We recognized each other and greeted. Fotunately, we made it to the boarding gate in time so we reached Warsaw on time. Otherwise, this blog would probably tell about how beautiful Munich was :lol:. Oh ya, it was really cold there so I used multiple jackets and sweater :|. In Warsaw, I always tried my best for not getting sick or even close to sick. I was pretty successful to maintain my health there. In Warsaw Airport, some of ICPC volunteers had waited for us. We were almost immediately been delivered to our hotel. We staid at Radisson Blu Sobieski Hotel. There, we were told to wait in the lobby until our rooms were finished to be prepared. In the waiting time, I met the coach of the team from Institut Teknologi Bandung, Mr. Fajar. It was not a surprise that we recognized each other since we had met earlier in ITB when I went there to help in National Training Camp. Soon, I met few of the members of ITB team. And I was really happy to see Mrs. Inggriani Liem (Bu Inge) there :). For your info, she was one of my favorite coach in National Training Camp that I attended in my high school life, and it is an honor for me to work together with her in coaching Indonesian team for IOI these days. We chatted a bit. After they left, we got our keys and then we took a rest in our room. Vu and Trung were in the same room. I and Mr. Tung were in the other room. In the afternoon, Mr. Tung left to meet his relative. I took some rest and tried to connect to the wifi, but failed. We went lunch together in a Turkish restaurant. Since I was very hungry, the food tastes really good… although I honestly did not know what I ate at that time. I didn’t care, anyway :|. Then, we come back to our rooms. Before coming back, Vu told me that we could connect to the internet using the LAN cable provided on the desk. And yes, I could online! In the afternoon, we went to an American restaurant. The meal was very expensive. But we still ordered it anyway. Soon, we realized that the food was not really expensive. The food was really huge :lol:. I was really full after eating all the meal. We walked around the hotel after that, took some photos, and went to sleep (of course in hotel, not in the street).